Expanding and shifting this cube of space to its multidimensional and higher iteration is the Cube of Metatron. 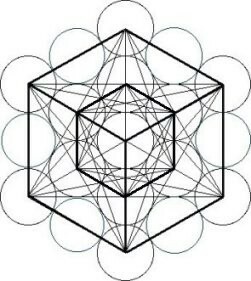 Twenty-two lines/paths in the Cube expand to seventy eight lines in Metatron’s cube, each line begetting an archetypal form unveiled in the Major, and Major and Minor Arcana, respectively. Physicist Michio Kaku notes “Each subatomic particle represents a note on a vibrating string or vibrating membrane. We now have a candidate for the “mind of God” that Einstein wrote about for the last 30 years of his life, the “mind of God” in this picture is cosmic music resonating throughout 11 dimensional hyperspace,”[viii] This is a beautiful and lucid articulation of Qabalistic metaphysics, in harmony with budding theoretical physics. In the western mystery tradition the Tree of Life is the dynamic structure through which consciousness transforms itself into the four elements in the dimensions of energy, matter, time and space. 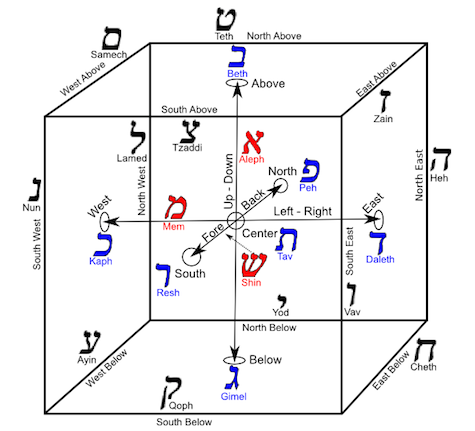 The eleven objective Sephiroth or dimensions are connected through twenty-two subjective pathways, corresponding to the twenty-two letters of the Hebrew alphabet and the archetypal keys of the Major Arcana. Similar in intent to eastern mandalas and yantras, the twenty-two Major Arcana are an archetypal journey into a 5th dimensional state and integration with the Source network. The Soul’s journey around the Cube of Space into reunion with the central point was first articulated in the Qabalistic Book of Formation, and developed further by Builders of the Adytum founder Paul Foster Case in the early 1900s. This journey elevates and expands individual consciousness from a water-based neurochemical soup, to a consciousness tuned into the subtle frequencies permeating space, towards the ultimate state of integration with the sub-atomic Source Intelligence network. The primeval geometric instruments used in the orchestration of creation find expression in nearly every wisdom tradition. Eight symbols give rise to the 64 hexagrams of the I Ching; the first binary system, ultimately leading to 64bit computing. There are 64 classical arts listed in many Indian scriptures. 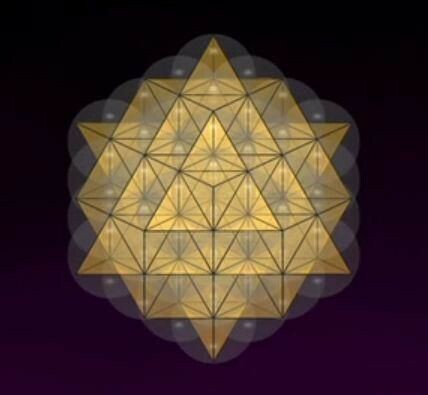 The perfected Qabalistic structure is a 64 star tetrahedron, the Merkabah. The outside of a 64 tetrahedron has 144 faces, a significant number in the Juedo-Christian tradition. Its structure is a cubeoctahedron or vector equilibrium described by Buckminster Fuller, with eight star tetrahedrons placed into the negative space of the central, perfectly equilibrated form. Physicist Nassim Haramein arrived at a 64 tetrahedral structure as the fundamental form of “space”. In a recent paper “Quantum Gravity and the Holographic Mass”[ix] Haramein accurately predicts the charge radius of the proton months prior to the LHC providing updated measurements. He exposits the structure of space as “Spherical plank units in a generalized holographic approach”, or a three dimensional Flower of Life. In an earlier paper with Dr. Elizabeth Raucher he demonstrates that space-time is not simply curved to produce gravity, but also curled, like water flowing down a drain[x]. The governing principle for this flow is what the mystery schools have taught for millennia and physicists Nima Arkani-Hamed and Jaroslav Trnka’s recent description of the amplituhedron[xi] elucidates in modern physics; geometry is the underlying organizing principle and key to unifying and understanding interactions between the macro and microcosmic. Every being in the universe adheres to a vibration / periodicity and is reducible to a number or a ratio. As a wise man said, “Mathematics is the language of gods”. This primordial rhythm and its harmonics are captured under the topic “Seelam” by Mamuni Mayan in ancient Tamil texts. Below are more details. We know that the Paramaanu or God’s particle is a cube. This particle with the primordial vibration combines with other particles to create a shape. The Paramaanu combines in the multiples of 8 to evolve the next structure. Let us see the importance of 8 later, but remember 8 is the number for Lord Narayana and Om namo Narayana has 8 Aksharas. What do you call a cube called in Tamil? It is called Ganam (கனம்). This also means heaviness, gravity, honor, dignity, abundance, plenty. To indicate it is a square cuboid they call it கன சதுரம். The process of the addition of Paramaanu into bigger units is called as Ganam (கணம், गणं). In Tamil both the Cube and the additive resultant are called as Ganam and the only difference being that in Cube it uses a small “na” (ன) as an alphabet. In the additive process / resultant it uses a Big “na”(ண). The big “na” signifies that due to the additive process the small (na) becomes big (na). This additive process starts because of the first rhythmic circular force also called as a Suzhi (சுழி) in tamil which means “loop”. Here comes the beauty. The Lord of or the energy associated with this additive force (Ganam) is called as Ganapathi (கணபதி, गणपती). Note this is the bigger “na” used and not smaller “na”. He is associated with the first circular force – Suzhi (and hence he takes the first honor in any Vedic ritual. This means Lord Ganapati is the first process in the evolution and everything has to start with him. Even if it is Lord Shiva or Vishnu it does not matter, the very first honor goes to the Lord of Ganas. Many Indians when they start writing (atleast few decades back) they first start with this symbol at the top of the page before anything for a successful completion of that activity. If I add my own inferences to the above with a caveat that everything else I have written have a solid back up mostly from our own study of languages (as you can yourself see) and our scriptures. The symbol above signifies that what was “a point” with untouched / non-interacting energies / resulted in the primordial first circular force out of a pulse and also signifying that every circular force shall also collapse back to a point. Also the bigger / heavier things are formed or created by its smallest unit and hence symbolically the heavier ones are carried by the smaller units. To signify this may be a god in the form of an elephant is carried by a mouse. This means “May you the Lord of Ganas, Ganapati”,… . so it goes. The Study of this additive force which leads to the formation of everything in the universe is Mathematics in Sanskrit and Tamil. We will see that the multiples of 8 in which the additive force moves is codified as Lord Narayana or Vishnu and the five state manifestation process as the five letters associated with Lord Shiva. The nature’s primordial secret in this way and codify it for the common benefit of the world and carry it for ages. These are just a start and please wait for the other interesting aspects to unfold. In the last few decades the main stream modern science has started accepting concepts like uncertainty principle, wave mechanics, quantum mechanics, and periodicity of the wave pattern. Most importantly it is about the fundamental wave pattern of any energy or matter and the harmonics of these wave patterns falling in a particular form and proportion which is dictated by geometry / mathematics. In all the modern scientists are still trying to understand the depths of science of the subtle aka the sacred spatial geometry. Most of the eastern philosophies have mastered this science and have codified these natural laws as a part of their religion, which is often dismissed as superstition. Earlier we have learned that in Tamil and Sanskrit the meaning for word Science (Vingyanam) is “Knowledge of the Space”. Modern science is moving in the right direction albeit very slow and they are trying to understand as to how elements are bonded within a molecule in addition to what elements constitute them. For example Chlorophyll molecule consists of Carbon, hydrogen, nitrogen and magnesium (Mg at its core) has a complex 12 fold Pattern – just one such typical pattern which can convert sunlight into life substance. The same pattern exists in our RBC cells just that it has an iron at its core instead of magnesium. The understanding about the human body especially, “the spatial awareness that exists in each and every cell is due to the different sensory organs tuned at frequencies”, led the scientists to unravel the innate spatial geometry of life. Be it living, non‐living beings, abstract forces like gravity, nuclear force, electromagnetism, heat, movement of astronomical bodies it does not matter what, everything in this universe adheres to a vibration / periodicity and is reducible to a number or a ratio. As a wise man said, “Mathematics is the language of gods”. This primordial rhythm & its harmonics are captured under the topic “Seelam” by Mamuni Mayan in ancient Tamil texts. We will explore more in detail tomorrow. Sacred Geometry – The Blueprint of Creation? Sacred Geometry is the blueprint of Creation and the genesis of all form. It is an ancient science that explores and explains the energy patterns that create and unify all things and reveals the precise way that the energy of Creation organizes itself. On every scale, every natural pattern of growth or movement conforms inevitably to one or more geometric shapes. As you enter the world of Sacred Geometry you begin to see as never before the wonderfully patterned beauty of Creation. The molecules of our DNA, the cornea of our eye, snow flakes, pine cones, flower petals, diamond crystals, the branching of trees, a nautilus shell, the star we spin around, the galaxy we spiral within, the air we breathe, and all life forms as we know them emerge out of timeless geometric codes. Viewing and contemplating these codes allow us to gaze directly at the lines on the face of deep wisdom and offers up a glimpse into the inner workings of the Universal Mind and the Universe itself. The ancients believed that the experience of Sacred Geometry was essential to the education of the soul. They knew that these patterns and codes were symbolic of our own inner realm and the subtle structure of awareness. To them the “sacred” had particular significance involving consciousness and the profound mystery of awareness – the ultimate sacred wonder. Sacred Geometry takes on another whole level of significance when grounded in the experience of self-awareness. Geometric shapes actually represent the manifest stages of ‘becoming’. To see and work with unity and wholeness in geometry can help abolish our false notion of separateness from nature and from each other. Through Sacred Geometry we can discover the inherent proportion, balance and harmony that exists in any situation, all manifest reality and even the circumstances of our day-to-day life. Leonardo Fibonacci was an Italian mathematician who introduced to Europe and popularized the Hindu-Arabic number system (also called the decimal system). He contributed greatly to number theory, and during his life published many important texts. He is also known for the Fibonacci Series, a numerical series found frequently in the natural world. The Fibonacci sequence is generated by adding the previous two numbers in the list together to form the next and so on and so on. (1, 1, 2, 3, 5, 8, 13, 21, 34, 55…). Divide any number in the Fibonacci sequence by the one before it, for example 55/34, or 21/13, and the answer is always close to 1.61803. This is known as the Golden Ratio. One of the most profound and significant activities encompassed within sacred geometry and lightSource is the ‘Golden Mean Spiral’, derived by using the ‘Golden Ratio’. The Golden Mean was used in the design of sacred buildings in ancient architecture to produce spiritual energy that facilitated connectivity with spiritual realms through prayer.Our reality is very structured, and indeed Life is even more structured. This is reflected though Nature in the form of geometry. Geometry is the very basis of our reality, and hence we live in a coherent world governed by unseen laws. These are always manifested in our world. The Golden Mean governs the proportion of our world and it can be found even in the most seemingly proportion-less (active) living forms. All types of crystals, natural and cultured. The hexagonal geometry of snowflakes. 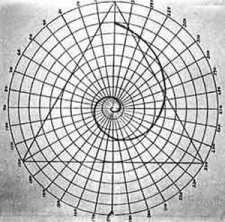 Creatures exhibiting logarithmic spiral patterns: e.g. snails and various shell fish. Birds and flying insects, exhibiting clear Golden Mean proportions in bodies & wings. The way in which lightning forms branches. The way in which rivers branch. The geometric molecular and atomic patterns that all solid metals exhibit. Another, perhaps less obvious but most significant example of this special ratio can be found in Deoxyribonucleic Acid (DNA) – the foundation and guiding mechanism of all living organisms. The understanding of geometry as an underlying part of our existence is nothing new, and in fact the Golden Mean and other forms of geometry can be seen embedded in many of the ancient monuments that still exist today. The Great Pyramid (the oldest of these structures) at Giza is a good example of this. The height of this pyramid is in Phi ratio (e.g. the Golden Mean Ratio) to its base. In fact, the geometry in this particular structure is far more accurate than that found in any of today’s modern buildings. This explains why popular among spiritually significant shapes are pyramids and hemispheres (e.g. the domes, that are the basis of religious buildings, be it a mosque, a church or a synagogue). These particular shapes are energy emitters; they are shapes that produce a type of penetrating carrier wave which Chaumery and De Belizal named negative green (which acts as carrier-like radio waves that carry sound information). The vibrational quality of the Golden Mean gives it very strong communication properties, which facilitate resonance with higher realms in prayer. We live in the 3rd dimension, or the ‘Plane of Manifestation’. The Golden Mean is an intra-dimensional doorway though which matter emerges into manifest 3-D reality. For example, when a star is born it follows specific number sequences or universal rules, the same rules of life in the expansion process. Then we see the light! Thus the Golden Mean is the “fingerprint” of creation. When we re-create this moving and always expanding sequence, we have in effect – ‘the exact movement of creation in the expansion process’. When lightSource is playing, one is encountering and literally being bathed in this ‘Golden Ratio’ creation activity… undeniably one of the most harmonious, balancing experiences one can interact with. I know him in my heart. Who knows the Purusha thus, attains immortality in this very birth. I know of no other way to salvation. Vastu Purusha facing down is symbolic of waves of Vastu energy drizzling down onto and into a Vaastu building. This is Cosmic Space (Consciousness / Quantum field) transforming itself into matter and co-mingling with Vaastu Purusha within the center of a Vaastu building. Vaastu Purusha facing upward represents the Vastu Energy of the earth rising upward from the earth’s central cubicle core and entering into a Vaastu building then co-mingling with Vastu Purusha. Scientists have recently shown what Mayan proclaimed in 10,500 BC. That is, the central core of the earth is cubical (Macroabode). Scientists have estimated that this cubical form is about 1200 kilometers square. If you analyze this according to Mayan’s theory the end product is amazingly interesting. That is if you divide that number by 9; then divide that product by 9 and do this 8 times then you come up with a number (about 1 and 3/32 inches) that is very close to Mayan’s angula (1 3/8 inches). This angula is the measure found on the thumb and middle finger of the human body of the human who is enlightened or in harmony with the Divine! From this I can only say that 1200 m is only approximate. But a very close approximation. I believe that if the cubicle form found in the center of the earth could be exactly measured and that measurement were reduced as above it would come to 1 3/8 inches (and we can find the exact measure of the cubical earth center by using 1 3/8 inch). I expect the cubicle center of the earth to be 1503.4063 m and not 1200 m. The measurement that Mayan says is the finger measurement of the ideal human who is in complete harmony with the Universe. The 8×8 form is the fabric of the subtle universe – a description of the Unified Field and a description of the body of the Divine – Vastu Purusha. The 9×9 cubicle form is a description of the fabric of the gross Universe known as Vaastu Purusha. How do we come to know this Purusha in our heart? Our microform is found in the cave of our heart. It is through the resonance we experience in a Vaastu house or temple that we can come to know this great Purusha in our heart. “The little space within the heart is as great as this universe. Fabric of The Universe: The Origins, Implications, and Applications of Vastu Science By Jessie J. Mercay. Text and diagrams, with permission, from Dr. Jessie Mercay, Fabric of the Universe, aumscience.com/wordpress. For any questions please visit http://www.aumscience.com. Formula of Arts or Life? The generation of forms out of the vibration of energy-space is identified and quantified by Mayan as “eight” and multiples of eight, in that order. Hence, in the table of time-units and space units you find the evolution of the measure starting from zero and evolving into forms, in terms of multiples of eight. …the nature of the number 8 is to turn into form. This is the basic formula of rhythms influencing the growth of all animate forms in a mathematical order and this is the fundamental measure adopted by the dancers, musicians, poets, sculptors and architects for all the development of artistic forms that they experience and generate from within. – Dr. V. Ganapati Sthapati, Building Architecture of Sthapatya Veda. What are the Sources of Knowledge?